Barbecue season is well-underway and I want to share a recipe for making pickles. After all, what better way is there to top off a burger than with pickles? Some 10 or so years ago, I watched Emeril as he prepared dill pickles. I was surprised to see that they weren’t canned but were stored in the refrigerator. I never did make them and that recipe, like so many others, was lost during one of my PC crashes upgrades. Then, a couple of years ago, during yet another long and sleepless night, I decided to surf the web looking for Emeril’s recipe. I never did find it but I did come across a number of recipes for bread & butter pickles. Now, I love bread & butter pickles and the fact that I could make them without canning was heaven-sent — and they’re delicious, to boot! As good as these pickles are, however, remember that since they’re not canned, they must be refrigerated and will not keep for longer than a few weeks. That’s the downside. The upside is that there’s no canning equipment to buy and store when not in use, not to mention this method is far less complicated than the canning process. So, I vote for refrigerator pickles but, if you can can, head to Paris and the Follies Berge- … er … um … but, if you can can, then start canning. Barbecue season will be gone before you know it. Whenever possible, I use pickling cucumbers to make my pickles because they’ve fewer seeds. My second choice would be English cucumbers, another variety that’s also lower in seeds and that’s usually sold covered in plastic wrap. When all else fails and burgers are on the menu, I’ll use “baby cukes” but, because these babies are smaller in diameter, I’ll slice them on an angle to increase their relative size. 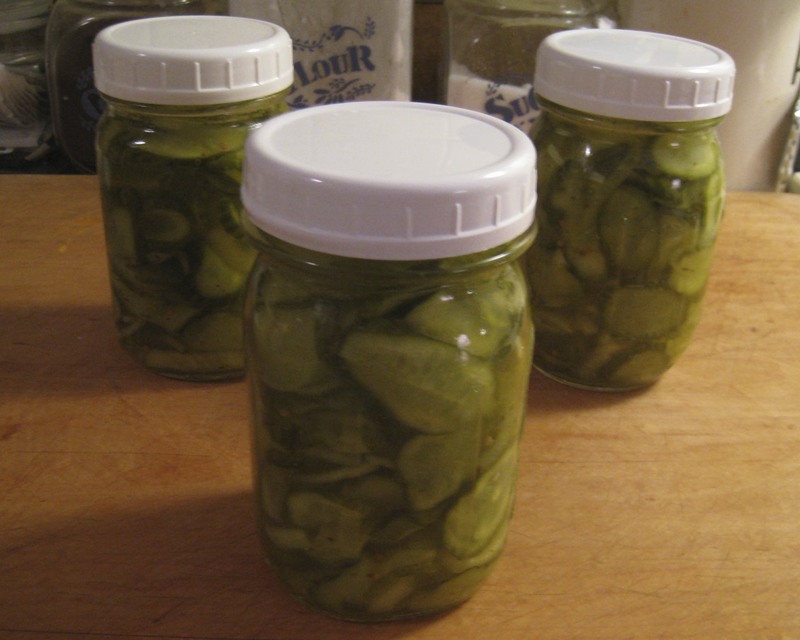 As for the yield, the last time I visited Zia, I used 2 pounds of baby cukes and made 3 pints of pickles (pictured below). Most of the recipes use, in varying amounts, the ingredients I’ve listed, although I’ve seen some that add dill seed, garlic, paprika, red pepper flakes, cinnamon sticks, and the list goes on. Make a half-batch using my recipe, have a taste, and make adjustments in the next batch, if need be. The recipe is neither expensive nor time-consuming and is, in fact, pretty straight-forward. You’ll be amazed at just how easy these are to make and, if you’re at all like me, you’ll never go pickle-less again. Place cucumbers, onion, and salt in a large strainer/colander and mix well. Place strainer in the sink where excess water will drain for one hour. Combine the vinegar, sugar, mustard seeds, celery seeds, and turmeric in a large sauce pan, over med-high heat, and bring to a boil. Reduce heat, add cucumbers and onion to the pan, place a dish on top of the mixture to keep the contents submerged, cover the pan, and simmer for about 5 – 7 minutes. Place the mixture in sterile jars and allow to cool a bit before covering and placing in the refrigerator. Best when served fully chilled. Pickles will keep for a few weeks in the refrigerator. I’ve come across similar recipes for dill pickles but I don’t find them nearly as good as this one for bread & butter pickles. If and when I find one — or some reader sends me one — I’ll share it with you. Similarly, I’m on the look-out for a good pickling liquid for other vegetables. When found, that will be shared, as well. Lastly, I’ll be posting a great recipe for Chicago-style giardiniera in the weeks to come. Since writing this post, I’ve started canning/preserving — something I thought I’d never do. (Please keep thoughts of old dogs to yourself.) As mentioned, these pickles will last, as-is, for several weeks in the fridge. If canned, they will last up to a year on a cool, dark shelf. To can them, follow the above instructions. Once the jars have been filled with lids and tops in place, though not sealed tightly, place them in a boiling water bath deep enough to cover the jars by at least an inch. Leave them to process for 10 minutes before removing them to a cloth-covered surface, where they should remain undisturbed for 24 hours. At the end of that time, test to make sure each has sealed and store in a cool, dark place. Those that haven’t sealed properly must be immediately refrigerated and used with the next few weeks. This entry was posted in Condiments & Snacks, Vegetarian and tagged Food, Pickles, Recipes by ChgoJohn. Bookmark the permalink. I couldn’t agree more. I just bought more cukes to make another batch for this weekend’s barbecues. Thanks for stopping by. Just made some! They will not last…awesome recipe. These sound perfectly delicious. 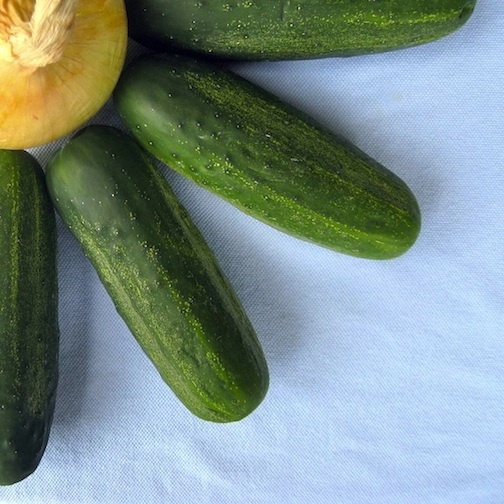 A nice combination of sour and sweet.And your photo of the cucumbers is very nice. Mmmmm. Thank you for your kind words. This really is a good and, best of all, easy recipe for bread & butter pickles. They’re a big hit among my family and friends. See, I missed this one! My dad would pickle his cucumbers every year and I would just eat them never asking him how he did it!! He had scraps of paper with his notes but it’s really hard to understand. I believe I now have no excuse not to do this! My kids will love this! I love the name Bread and Butter pickles, and I’m picking up ideas here as iyou know t’s pickling time, I see tumeric and celery seeds, loving the idea ! A definite necessity for a good burger! I love to do refrigerator pickling! Loads of flavor for minimal effort. One of these days I should get into heavy duty canning, but I’ve resisted that thus far. 😉 Really nice – thanks. At the time I wrote this post, John, I was certain I’d never can anything. Now I’ve got plenty of jams, pickles, and peppers in jars of all sizes. At Christmas I give gifts some of them as gifts, as well as mustards and ketchup. Once you preserve your first batch of anything, there’s no going back — I’ve got the filled Bell jars to prove it! Thanks for taking the time to visit this old post and comment, John. Thanks for a great recipe for refrigerator pickles. Unfortunately, we spent the entire day making dills and bread and butter pickles the old fashioned way and we’re beat. We saw your recipe for giardiniara and tired as we are, my wife is now chopping a new batch of fresh veggies to try the recipe out. Can’t wait to see how it comes out. Thank you for dropping by and taking the time to leave such a nice compliment.